There are a myriad of choices in log cabin flooring depending on budget, looks, durability, maintenance and even health. It’s important to take all these into consideration when selecting flooring and not just base your choice on what seems to be cheapest at first glance. •	Think through your log home flooring plan and decide ideally what type of flooring you want to have in each area. Calculate your floor area in square feet for each room so you can price out the cost for materials and installation. • High traffic areas and entrance areas are good places to select impermeable flooring like slate or tile. Wet areas such as bathrooms are another place for this. The entrance area inside an exterior door also acts as a brush-off zone where dirt, dust and sand is deposited from your shoes. By choosing tile or slate for this area you will save wear and tear on your hardwood flooring. •	Everyone loves wood flooring, but what type of wood is best? Generally very hard woods such as maple, hickory and oak work best for longevity, but also consider pine planks for your log cabin flooring. It looks rustic and warm and even a soft wood floor like this can stay beautiful in less-trafficked areas such as a cabin loft. • Check out our page on the Janka Hardness Scale,which lists 56 different species of wood according to their hardness and therefore their suitability for use as flooring. There are many different hardwood flooring choices suitable for each situation and style. •	If you’re building on a slab you will be limited by what you can install directly on the concrete. Engineered hardwood flooring can be glued down directly to the concrete, or you can install pressure-treated sleepers to the concrete first, then standard ¾” hardwood flooring on that. Tile can be laid directly on the concrete but never carpet, vinyl, or hardwood flooring. •	An inexpensive option for concrete is to stain it either before it’s poured or afterwards using an acid etching. This can be a very interesting option but use an experienced installer and pick your color choices carefully. •	If radiant floor heating is in your plan for your log cabin flooring, you’ll want to go with tile or thinner engineered hardwood flooring that is more stable and transmits the heat more efficiently. Almost any flooring material can be used with radiant floor heating but some is better than others. 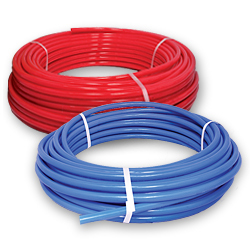 Install PEX tubing in your slab for the radiant floor heat. • Floor finishes are another factor in your decision-making. While choices like tile or vinyl require no finish (apart from sealing grout lines in tile), hardwood flooring requires a finish. From a builders/installers point of view, the best way to go is with pre-finished flooring. Nothing can beat a factory-applied finish where they can control humidity, cleanliness and flow rates, and the price of pre-finished flooring compares favorably with site-applied varnishes and polyurethanes. 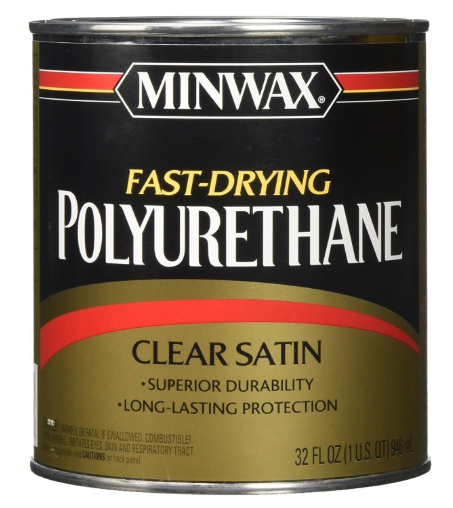 If you do need to apply a finish on-site, your best bet is multiple coats (two is an absolute minimum) of polyurethane, preferably something used for gym floors or commercial applications. Remember that the glossier it is, the harder it is, but also the slipperier it is. We like to use semi-gloss for floors. • Going green? A popular choice for environmentally-conscious green builders is bamboo flooring since it is a rapidly renewable resource according to the U.S. Green Building Council’s LEED program. Technically a grass and able to be harvested without killing the plant, it’s a great green product, but since most bamboo comes out of China check that it’s not manufactured with urea-formaldehyde. There are many factors to juggle when deciding what to walk on in your log cabin. Flooring choices run the gamut in price, durability, ease of installation and maintenance so consider carefully.